At the battle of Aphek the Philistines defeated the Israelites in the days of Eli and Samuel (1 Sam. 4:1-11). 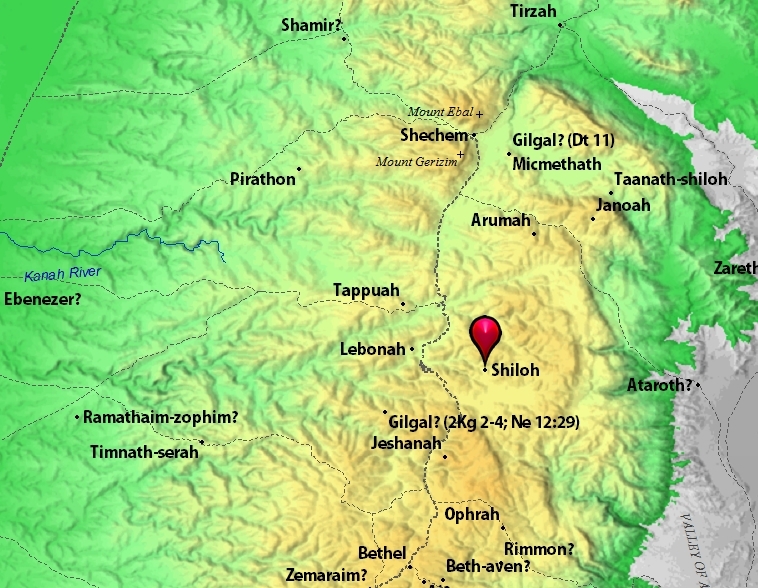 Look at map to see Shiloh, where the tabernacle was, and Aphek. Both are in the tribal territory of Ephraim. Location of Aphek relative to Shiloh, tribal territory of Ephraim. Map by Scott Richardson. This complex of buildings [buildings in location designated area C] was destroyed by a violent conflagration whose traces were visible everywhere: charred floors and heaps of fallen bricks, sometimes more than one meter deep (some of the bricks were visibly baked by the fierce fire). Here and there parts of the fallen roof were identifiable. 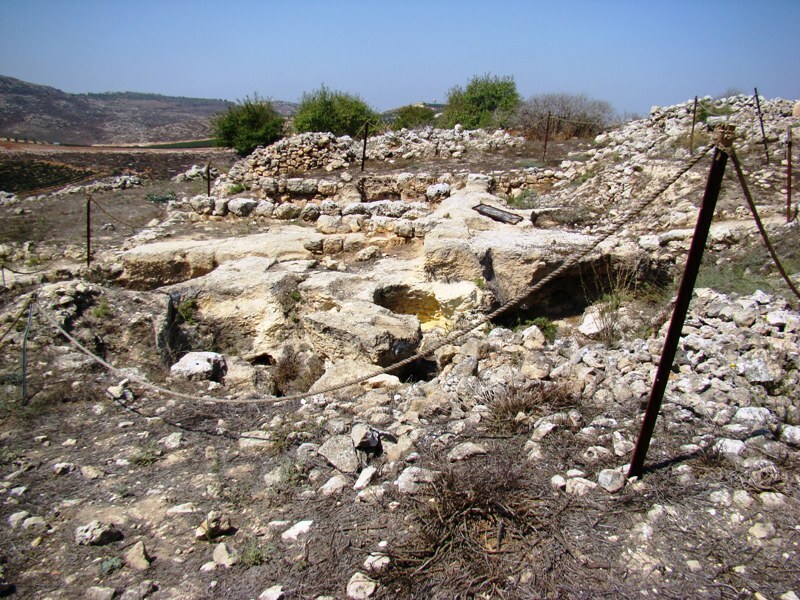 As suggested by Albright following the Danish expedition’s excavations, this may be attributable to the Philistine destruction of the site (mid-eleventh century BCE) (The New Encyclopedia of Archaeological Excavations in the Holy Land, IV.1368). This photo shows some of the excavations at Shiloh. Excavations at Shiloh. Photo by Leon Mauldin. 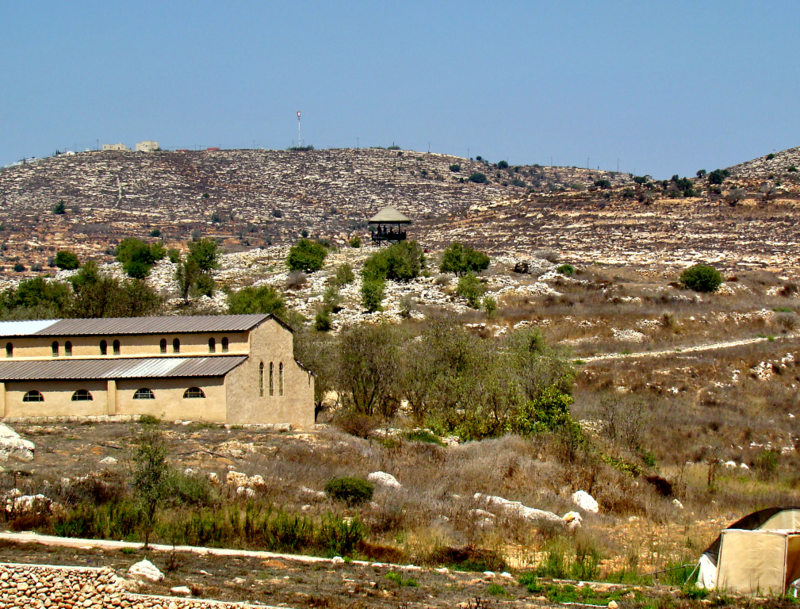 Following the destruction of Shiloh, the tabernacle was at Gibeon in the days of David and Solomon, until Solomon built the temple in Jerusalem. We plan to follow-up on that in subsequent posts. Moving ahead to the Byzantine Period, churches have been found from the fifth and sixth centuries AD. 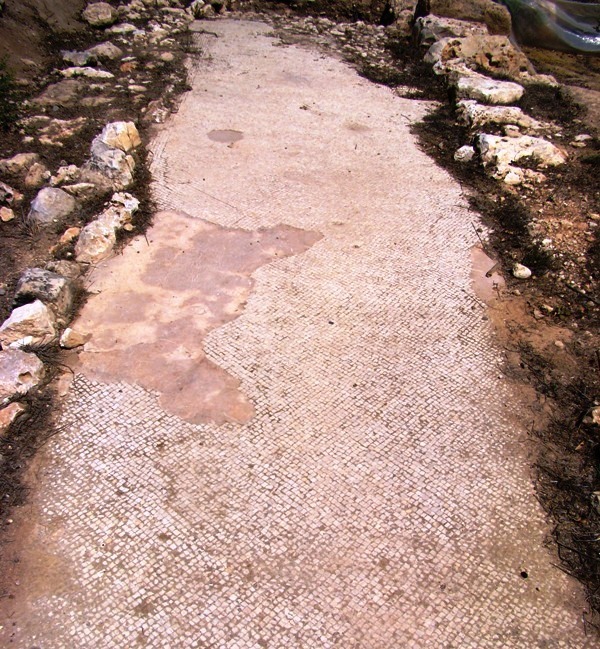 A section of Mosaic floor may be seen in our photo. Mosaic Floor at Shiloh. Byzantine Period. Photo by Leon Mauldin. 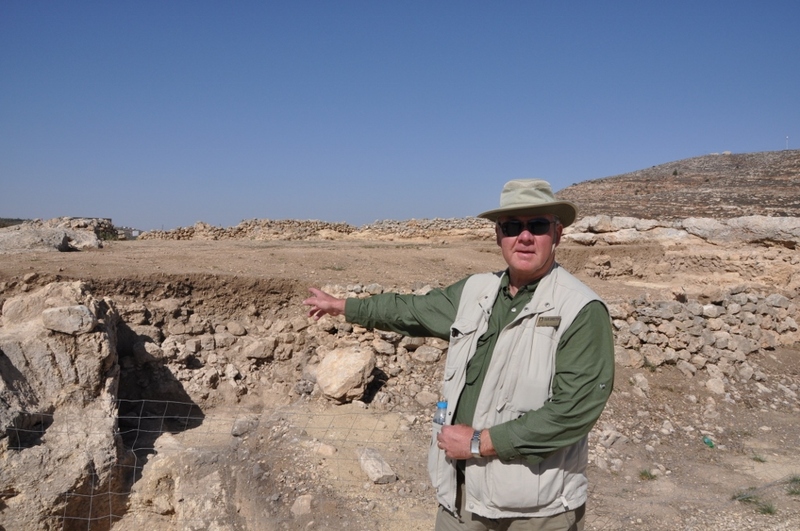 To see the remains of Bible places can be tremendous help in visualizing the biblical text, don’t you agree? 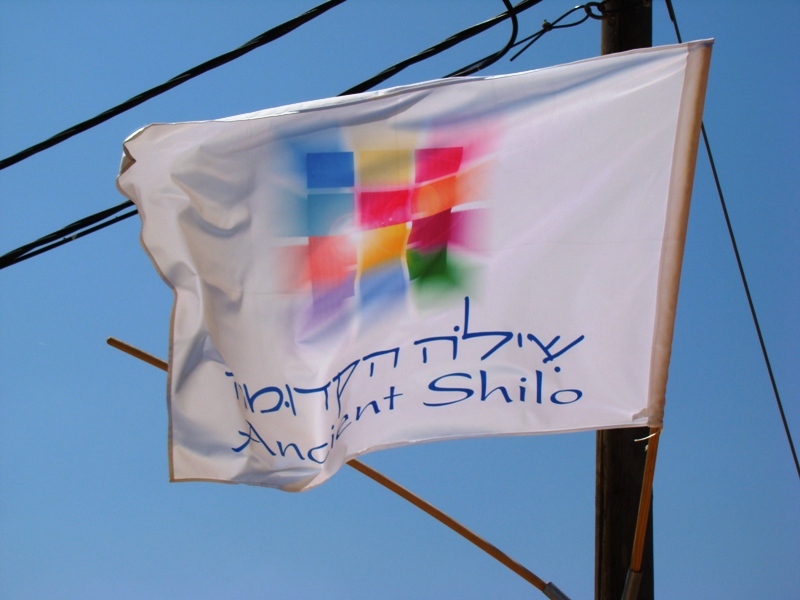 Shiloh Flag. Photo by Leon Mauldin. 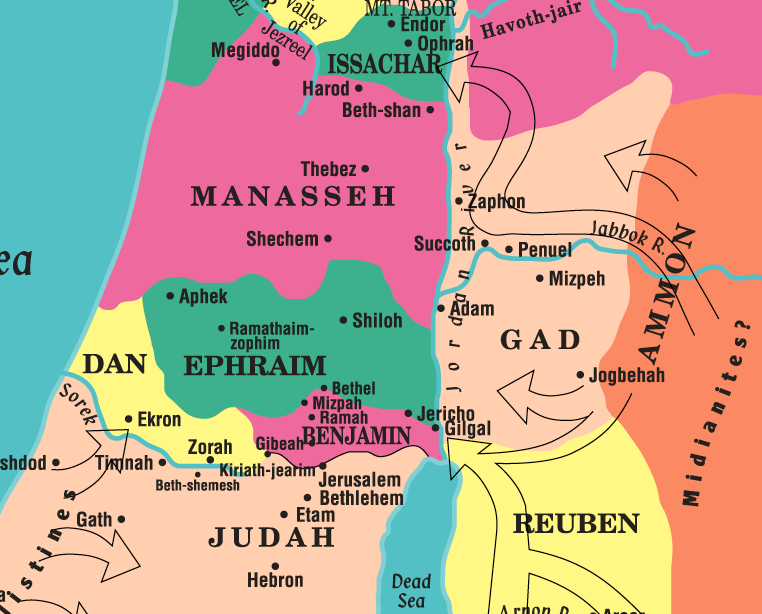 Using the early date of the Conquest (1407/6 BC) as the approximate time that the tabernacle would have been erected at Shiloh (Josh. 18:1), and accepting W.F. 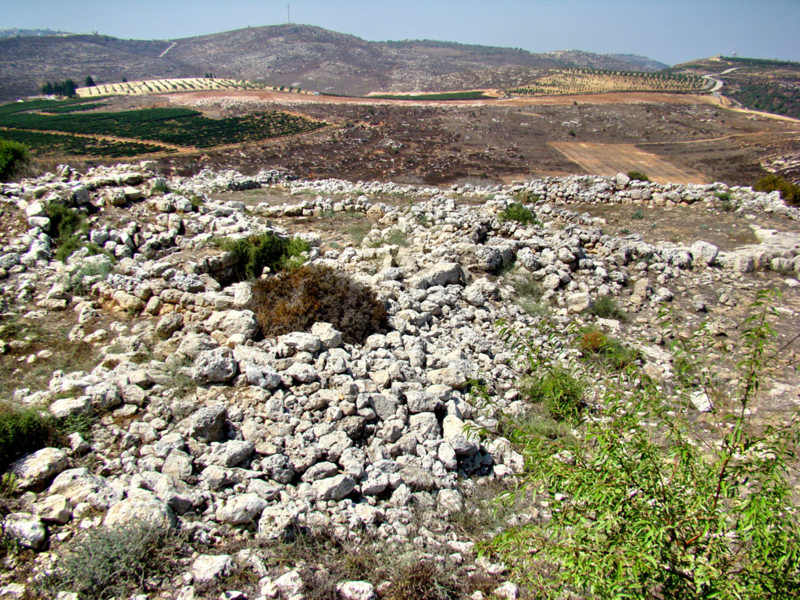 Albright’s dating of Shiloh’s destruction at 1050 BC, that would mean that the tabernacle stood at that site for about 350 years. 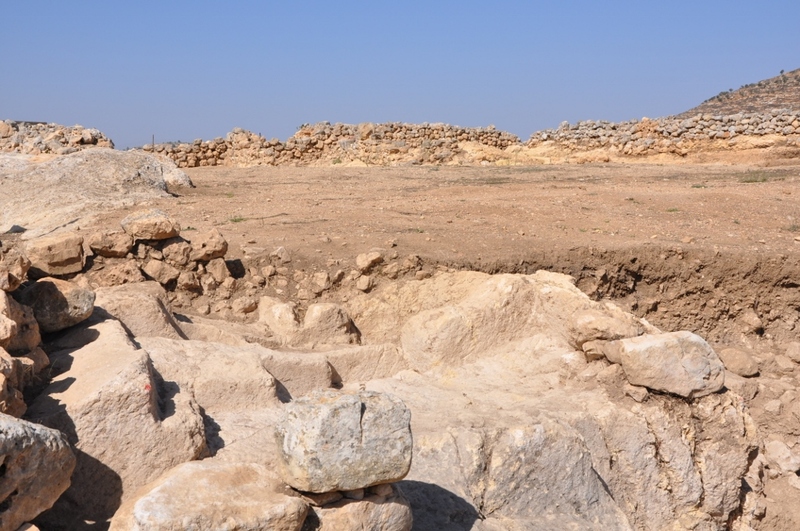 As we saw in our previous post, the biblical text makes reference to Shiloh’s destruction as a well-known fact but does so without recording the event itself. Most likely it was the Philistines who followed through with the destruction of the sacred site after the capture of the ark as recorded in 1 Sam. 4. 55 He drove the nations out from before them; he assigned them their tribal allotments and allowed the tribes of Israel to settle down. 56 Yet they challenged and defied the sovereign God, and did not obey his commands. 57 They were unfaithful and acted as treacherously as their ancestors; they were as unreliable as a malfunctioning bow. 58 They made him angry with their pagan shrines, and made him jealous with their idols. 59 God heard and was angry; he completely rejected Israel. 60 He abandoned the sanctuary at Shiloh, the tent where he lived among men. 61 He allowed the symbol of his strong presence to be captured; he gave the symbol of his splendor into the hand of the enemy (Psalm 78:55-61, NET). In our photo the proposed location of the tabernacle at Shiloh may be seen. Note the small rectangular area in upper center. Shiloh. Possible location of tabernacle in upper center. Photo by Leon Mauldin. Shiloh. Area in shape of rectangle is proposed site of the tabernacle. Photo by Leon Mauldin. 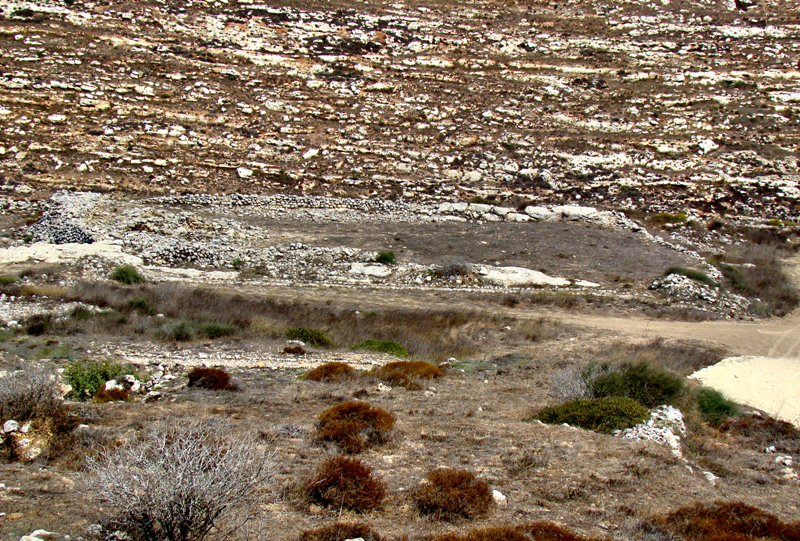 Shiloh was central to the nation of Israel for several centuries. The professed people of God of Jeremiah’s day had a serious problem–they weren’t listening to God. They convinced themselves they could do as they pleased and claim allegiance to God, and everything would be OK; after all, they had the temple. 7 If you stop doing these things, I will allow you to continue to live in this land which I gave to your ancestors as a lasting possession. 8 But just look at you! You are putting your confidence in a false belief that will not deliver you. 9 You steal. You murder. You commit adultery. You lie when you swear on oath. You sacrifice to the god Baal. You pay allegiance to other gods whom you have not previously known. 10 Then you come and stand in my presence in this temple I have claimed as my own and say, “We are safe!” You think you are so safe that you go on doing all those hateful sins! 11 Do you think this temple I have claimed as my own is to be a hideout for robbers? You had better take note! I have seen for myself what you have done! says the LORD. 12 So, go to the place in Shiloh where I allowed myself to be worshiped in the early days. See what I did to it because of the wicked things my people Israel did. 13 You also have done all these things, says the LORD, and I have spoken to you over and over again. But you have not listened! You have refused to respond when I called you to repent! 14 So I will destroy this temple which I have claimed as my own, this temple that you are trusting to protect you. I will destroy this place that I gave to you and your ancestors, just like I destroyed Shiloh (Jer. 7:7-14, NET). The tabernacle had previously been in Shiloh (Josh. 18; 1 Sam. 1-4, etc. ), but God had allowed it to be destroyed because of Israel’s disobedience. Jeremiah warned that the same fate was awaiting the temple, for the same reason. We recently had the opportunity to visit Shiloh. Some archaeological excavations were taking place at the time. Michal Haber, IAA staff member, and Ferrell Jenkins. Photo by Leon Mauldin. 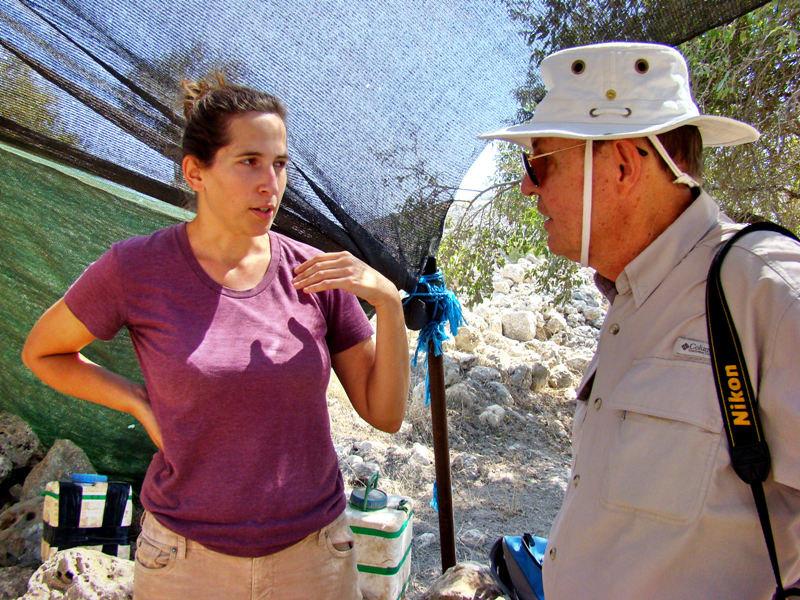 Mr. Jenkins mentioned to Michal Haber of the Israeli Antiquities Authority, who was supervising the excavation that he and I are members of the Society of Biblical Literature, Near East Archaeological Society, etc., and had an interest in what they were doing there at Shiloh. She graciously showed us around. What was being uncovered at this level was Byzantine and Islamic. The older remains (what she called “the good stuff”) were higher up. There is a covered platform conveniently situated that is helpful in giving a good view of the ruins of Shiloh. Note the upper center in photo below. Ancient Shiloh. At center is a covered platform helpful in viewing the site. Photo by Leon Mauldin. Several biblical texts flooded my mind while here. 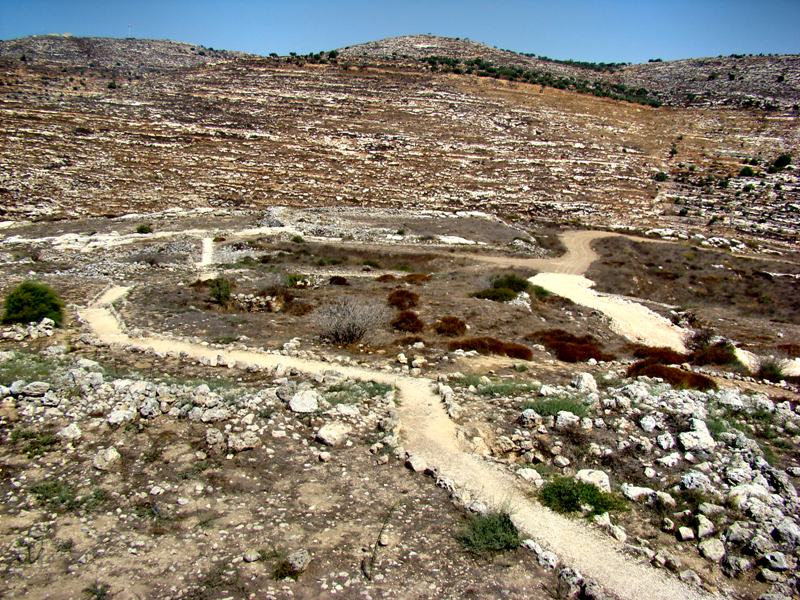 Early on during the Conquest of Canaan, the tabernacle was pitched here (Josh. 18:1ff). Then I thought of the days of the Judges, and of barren Hannah, praying here silently, when Eli the Judge and High Priest misjudged her to be drunken. She explained that she was praying that God would give her a son, and if He would do so, she would give him back to the Lord. That prayer was honored and Samuel was born (1 Sam. 1). Then I thought of the day that the Israelites battled the Philistines and were defeated (1 Sam. 4). Word came back to Shiloh that the Philistines had killed both of Eli’s sons (wicked sons, but they were priests). That was bad news, but then when Eli was told that the Philistines had taken the ark of God, he fell off his seat, breaking his neck and dying. It was at this point also that one of Eli’s daughters-in-law was in childbirth. When she heard that the ark of God was taken, as well as the news of her husband’s death and Eli’s death, with her dying words she said to name the boy Ichabod, which means “no glory.” Indeed, when God cannot dwell among His people because of sinfulness and stubborn rebellion, there is no glory. These and other texts come into play at this site. In our photo below you can see Shiloh in foreground, and then surroundings in the distance. Ruins at Shiloh. Photo by Leon Mauldin. You are currently browsing the archives for the Shiloh category.